I am still finding clues about my grandmother’s family in the old photo album we found hidden in the attic. Many of the photos might remain mysteries. As they have no caption or notations. But as I slowly go through them, I sometimes find a photo with a message on the back. In February, I was showing the album to a visiting cousin, when I flipped over the photo of a young woman. I was surprised to see it had a note on the back in Polish. I could understand a bit. It was to her cousin Thelma (my grandma). It had a date, June 6, 1946. And it had a place, Kielce. I was glad that I had finally found a photo from after the war. I thought that finally I had found someone who survived. I had thought the book was hidden because it was filled with those who perished. 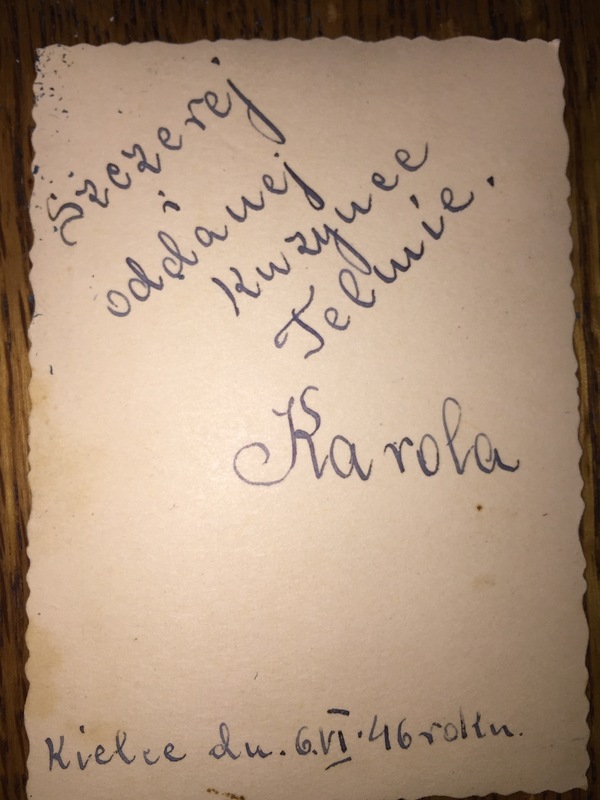 I posted the photo on the “Tracing the Tribe,” Facebook group to get a translation of the back. It was dedicated to my grandmother. “To my sincere/honest and devoted cousin Thelma from Karola. 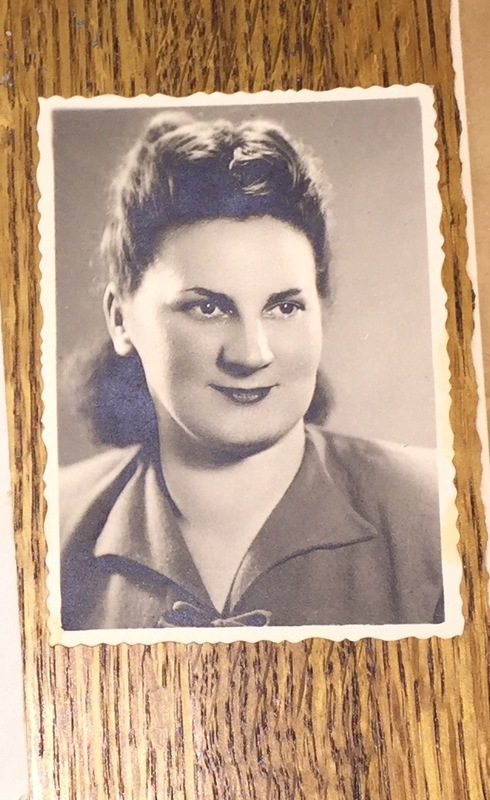 I knew they were related because Karola looks so much like my grandmother. I assume they are first cousins. 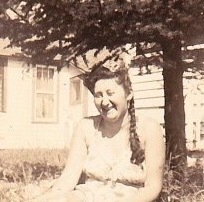 My Grandma Thelma summer 1942. I Don’t know if she survived! I started investigating Kielce. On July 4, 1946, there was a pogrom against the approximately 200 Jewish survivors of the camps who had moved back to Kielce. They were a tiny percentage of what once was a thriving Jewish community. Of those 200, 42 were killed and 40 were injured. This event started when a young boy told his father he was late because Jews locked him in a basement. It was a lie. But started a blood libel event. Polish police and soldiers participated. On July 14 nine Poles were executed for their role in this horrible massacre. Because of this event, Polish Jews who survived knew they had to leave Poland. It would never be a safe haven. And a mass exodus began. But what about my cousin? I tried finding her name on any lists. But I do not know her surname. I do not remember ever meeting her in the US, although I met most of my grandparents’ relatives. There were so few. I had not met her in Israel when I took my grandma there in 1976. I met many relatives then. (See previous blog: Speaking Yiddish Always Brings Holocaust Memories). I sent the photo to a cousin in Israel. Although we are just a month apart in age, she is a generation above me. My mothers first cousin. And her parents survived the war by fleeing to a Russia. She knew the family who survived and moved to Israel. She also has a picture of Karola, but knows nothing about her. So I am beginning to think she perished. Which breaks my heart. Did she send the photos to relatives in an effort to get out of Europe? What was happening? Was she alone? I need answers. I could not let my search end there. I have contacted a distant cousin who I met through Tracing the Tribe. He is a much more experienced researcher than I. I hope he will be able to bring me closure about cousin Karola. In the meantime I also continue to search for her. But I also continue to learn about the political and social anti-Semitism that led to this horrendous event and its aftermath. UPDATE: Karola lived: From another cousin who read the blog I found out this information: “Karola lived in Paris with her husband and beautiful daughter. They visited us for a few days when I was a teen. My mother kept in touch for many years, the daughter also came to NYC and stayed and then they seemed to lose contact.” Wrote my cousin.